Are you looking for any Protected Folder Lock giveaway ? If so, here you go. Almost everyone want to protect their personal folders in PC’s and Laptops. Most of us hide our folders in windows and assume our data is safe and hidden. Well, you are the not the only one who knows about hiding folders in windows. So just in-case if you want to hide your folders in a secured vault, then here is your chance. Coolpctips.com is celebrating its 2nd anniversary this 24th April 2012. So for our loyal readers, this is our second giveaway in the month of April 2012. We are giving away 30 license keys to our readers as a second giveaway after Dota License Keys. You have to just follow the below article to get your Protected Folder Lock key. Trust me, this Protected Folder Lock giveaway will surely allow you to have a peaceful time when some else is browsing your PC. Continue reading the post to get more info on IObit protected folder giveaway. 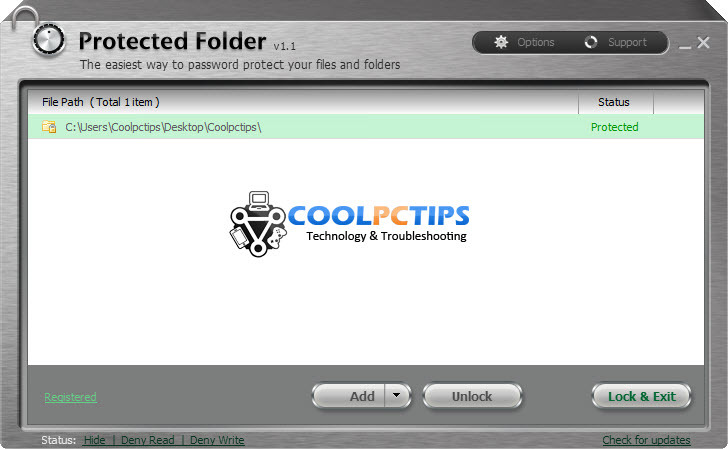 Protected Folder is an amazing software which is designed to password protect your folders and files from being seen. No one can read, modify or see your folders in your PC. Protected Folder lock is just like a safety vault where you can drag and drop the folders or files you wanted to protect. You no need to worry about the privacy, data theft, data loss, data leaks while using Protected folder. The key benefits of Protected Folder are it is extremely easy to use, You can hide folder from view, you can block access to files, folders and programs you wanted to. You can password protect the files so that others can see it but cannot access, read or view the content in it. Why IObit Protected Folder Lock Giveaway ? IObit Protected Folder Lock when compared with other products is very much easy to use and comes with a unique design to explore more. 1. IObit Protected Folder will keep your PC safe and error free. You can see your PC running at top speed with out any lags. 2. IObit Protected Folder Lock was designed by top-flight programmers and system designers. The product is recommended by many IT experts and editors around the globe. 3. The unique design will make you browse easily and understand the interface in a more better way. 4. IObit Protected Folder has been downloaded more than 100,000,000 times so far. Almost 98% of the users recommend IObit Protected Folder Lock to friends and family. IObit Protected Folder come for a awesome price of $19.95 for each license. But if you want to get the license for free, you have to complete the below given steps.The giveaway will end on 1st May 2012. We have enough keys to give you all. But make sure you follow the steps carefully. We will check for the shares and likes you participated in. 1. Like our Facebook Page and Join our Facebook Group. 2. Share this post on your Facebook wall and post the shared link in comments. 3. Subscribe to our RSS and Leave a comment about IObit Protected Folder. Note that the key is valid for one single system only. If you still have any queries to proceed further, you can always ask us via comments below. Hope you all get your IObit Protected Folder license key. Share this post with your friends and allow them to get benefits out of this protected folder lock giveaway. Wow! First of all Congrats for the second year anniversary of CoolPCTips.com . I still remember when you started it on Blogger. In a very less span your site grew very big and huge. I wish a very good luck for Coolpctips’s future. And about IObit Protected Folder, A cool app and a very easy app to hide our data and information in our local PC where security has become very big need to our life. My 1st visit to coolpctipc. Count me in ! IObit Protected Folder Lock is a very gr8 and helpful tool…!! I hv shared the link . Can u tell me how 2 post the share link? bcoz am nt able to find the link fr the shared post in fb. I love you guys. Count me in. Congo Man keep on rocking…. Nice giveaway count me please …IObit Protected Folder will keep my PC safe ..and it is an excellent product..
Will be useful in hiding files. Thanks for the giveaway.. I like to use iobits protect folder for privacy. Much appreciated. Yes, I am looking for Protected Folder Lock giveaway, I’ve been searching the internet for several months and thank god I stumbled upon this site. This is my only chance to get Protected Folder Lock for free so I won’t let this one slip away. Congratulations for your 2nd anniversary and thanks for this fantastic giveaway and short review. I’m currently using Advanced SystemCare and Iobit Malware Fighter, so the only way to complete the perfect combination for my maintenance, security and privacy setup is by winning this giveaway and get this powerful file/folder application installed on my computer. I keep most of my personal and sensitive information on my computer, such as website username and passwords, pin numbers, credit card numbers, banking info, sensitive documents, as well as private photos and videos. I have to manually compress those files and put a password in order to keep them safe and it’s tiring to do the same thing over and over again. I would be extremely happy if you could help me to save few bucks by putting my name on the drawing list. I have liked your facebook page, joined your facebook group, subscribed to your RSS, as well as shared this giveaway on both facebook and twitter. Thanks again for the giveaway and good luck to all contestants. i want like to win iobit protected folder because i know it can save my personal information.With it i can set password and keep my family picture,my study material,bank credit card details safe..
IObit Protected Folder – it’s very easy to use tool designed to protect private files / folders in Windows. This program actually very easy to use and friendly to every user computer. Therefore I would like to win. Super program, thank you for the contest and wish you all good luck. Count me in please, sorry no facebook. how can I get de Licence? By Mail? here are the winners 🙂 Congrats guys. Why not me? What have I missede? Please tell me. I’m very lucky, I won! – Congratulations to all winners. Yeah Yeah i have won a key. 30 keys and only 15 winners?